There are 6 reviews of Veni. Interesting little number. I picked up a sample based on the listed notes of the perfume. What I anticipated is not what I got. I was expecting a woody gourmand and instead received a heavy cinnamon infused wooden shavings. I barely detected any of the cardamon at all, which was a shame. Veni is not without happier notes - once the initial overload of cinnamon finally dissipated the saffron and guaiac lasted a good lengthy time, heavily leaning on the wood notes. Veni has some serious longevity, I will give it that. Eight hours after application my body heat was still sending out little waves of vanilla and wood. Veni isn't bad, but it's not great either. If your a fan of woody notes and can stand the cinnamon that it's worth a go, however having been pumpkin spiced through the last couple of months, I was so over those notes. Patchouli, vanillin, cardamom, cinnamon, resins, a dark, dry woody base, an odd note which I can not identify (something halfway aniseed and saffron? ), flowers, green-herbal notes (sage?). A bold note of aldehydes, which gives the scent that peculiar modern, metallic airy-dusty vibe to the scent. Finally I also detect a slight leather-like note on the base, dry and shady but quite subtle and discreet (it may just be the drier side of resins). There is something sweet and floral that reminds me of L'instant pour homme by Guerlain, not the entire scent, just this note, something like violet and some sweet-silky resin notes (galbanum or caramel). To be honest this all appears a bit "mute" to me, a bit boring and monotone, heavily synthetic in a non-creative way. Some of the initial notes are pleasant, e.g. patchouli and the uncommon aroma of saffron, but they vanish quite soon, leaving the stage for hours to a sort of bold, monolithic "dry resins galore" with just some ultra light (therefore, pointless?) dissonant breezy floral-spicy notes. Frankly I don't "get" it globally, maybe it's me, but more than "bad" I guess I may say this scent smells confused and uninspired. I came, I saw and I...YAWN? A Roman conquest clearly this is not though putting one to sleep comes a close second. Perhaps Histoires de Parfum is a victim of its own success, for I can't help but hold it to a high standard for its past ingenuity. VENI is a rather attractive and seamless blend of floral musk and wood spices, with a resinously airy profile. The quality is still there, the carnation/floral element a touch too muted for my tastes, but the house's customary boldness in execution is sadly missing. 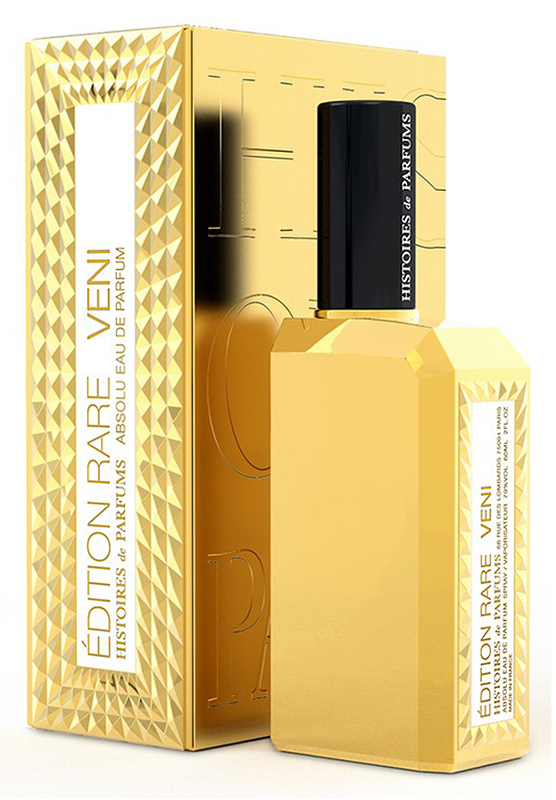 Historie de Parfums Veni is the first perfume of the trilogy of shiny golden bottled "Edition Rare" series named Veni / Vidi / Vici. In his poetic interpretation of the Cesearian quote, "I came, I saw, I conquered", Gerald Ghislan interprets Veni to represent of the "earth", while Vidi correlates to "wind", and Vici represents "fire". Poetic license at its best, I suppose. The relabeling of this phrase with elements of the earth works for Mr. Ghislan's explanation of the fragrances in an odd way. I don't personally think that the explanation helps understanding the fragrances and is confusing more than helpful because the association with the explanation doesn't really fit, but that is another story altogether. Today I wish to review the perfume and fragrance of Historie de Parfums Veni. Veni opens with and is fundamentally lavender. Reminds me of many lavender fragrances I've smelled over the years. Like all of the "Edition Rare" trio of fragrances there is a complex blending of precious spice, resins, and floral essences that make a lightly toned incense floral blend that glows with resinous complexities that are finely honed and fit the golden bottles very nicely. Veni reveals its lavender character immediately upon application and that fresh green slightly floral lavender is very wonderful to me - as are most lavender scents - it is a wonderful healing herbal aroma. Lavender blends seamlessly with cardamom and cinnamon for a lightly spiced fine woods view of lavender. The middle notes merge lavender with guaiac wood, saffron and carnation for a lightly toned sueded woods scent which is followed by a transparent and invisible patchouli, amber and musk base. The entire fragrance is seamless and moderately high pitched. The ingredients smell as if they were polished with ever finer gradients of polishing materials until an extremely refined lavender polished resin wood finish glows with a soft luster. 3 of 5 stars. I like it more than TF Lavender Palms but not quite as much as SL Encens Lavande or Invasion Barbare, in my world of lavender wood and incense fragrances. Thumbs up! Today i care about the first one of the new trilogy ( of fragrances appointed to set down a reconnection with the powerful natural elements), i mean Veni, namely the reconnection with the element of earth and a new Mr. Ghislain's perspective on the commercial side of the olfactory square. Whatta surprise (and it doesn't mean necessary in a good way)! As an Histoires de Parfums's great admirer i approached this new release expecting to discover a new brilliant work of experimentalism or anyway something more than vaguely classic, obscure, "neo- vintage" or decadent while my serendipity had been about a more common talky, fresh/warm and watery amber/musk fragrance with a widespread spicy sweetness (supported by the implementation of resinous galbanum and caramel). With all the differences of course, this fragrance could be located, in the course of its talky/liquid (sweetish, aromatic, resinous, yet more than vaguely creamy/intoxicating and herbal) beginning, in the same clan with Le Male, Luna Rosa Prada for men, Bogart Pour Homme, Penhaligon's LP No. 9 For Men and could be "conceptually" standing in a second time (when the "sweet talkiness" a bit recedes and a wet, light, sweetly spicy and milky-vanillic woodiness stands out) more properly on the same stage with some common sweetish talky/woody/watery releases a la Borsalino Panama, Ferrari Black, Nomad Crabtree&Evelyn, just vaguely a la more aromatic Rocabar Hermes (just for the spicy/creamy woodiness) etc, (but in some case with a more pronounced woodiness). Frankly Veni doesn't enbody my archetype of favorite smell and i find the aroma utterly boring and already roamed hundreds of times in accordance with the current mainstream taste. Sincerely i detect a too much pronounced final sweet ambery/musky woodiness as common in many recent releases i don't crave for. My neutral rating is confered because of the great Mr. Ghislain's talent and cause the Veni's aroma offers a far less synthetic and bombastic alternative for the lovers of this olfactory theme. P.S: testing again the juice on my skin i notice that, in the initial-central phase of the evolution, before the sweet spicy woodiness evolves, several trails conjure me up some Jaipur Homme's nuances. (Jaipur is more lemony-floral, less spicy but with a commonly appointed usage of balsams and boise notes). There are no member images of Veni yet. Why not be the first? Histoires De Parfums Edition Rare Veni, Vidi, Vici: The New Trio.